Preheat oven to 350°F. Line 12 x 1/2 cup muffin pans with paper baking cups. Beat butter & sugar until pale & creamy. Beat in eggs & 1 tsp of the coconut extract. Fold in flour, coconut & buttermilk. Spoon into paper baking cups - don't overfill. Bake for 20-25 minutes. Set aside to cool. Beat cream cheese & icing sugar until smooth. Beat in milk & remaining teaspoon of the coconut extract. Spread onto cupcakes. 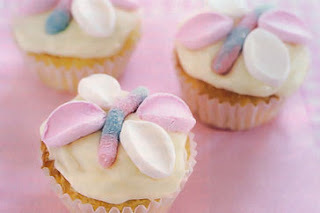 Place a Sour Gummy Worm on top of each cupcake. Place sliced marshmallows on each side to make wings.